Here is how our garage looks today. All the trim is up except the header boards, and one of our garage doors is in. That’s the good news. The bad news is that the garage door company fubar’d the hardware, though, which means we have to wait longer so they can get replacement panels. Because these are faux-carriage doors, we wanted hardware that at least helped maintain the illusion. Stephanie had discussed this with the door company, and the decision was that we would procure the hardware on our own (since they didn’t seem to be able to or want to get it). When she came out of the house during the install, though, she found a single, standard chrome handle had been installed near the middle of the door. It is weird how such a small thing can make such a difference, but it really does. The handle is neither centered on the door, nor centered on the piece of door to which it’s attached. It grabs your eye and really makes you look at it. Additionally, the lift handle at the bottom (not visible in photo) was installed in a similar off-kilter way. We are now waiting for new panels to be made, and these will end up going to someone that doesn’t want their “carriage doors” to look like carriage doors. Otherwise, though, the door looks really good and will look even better once it’s painted to match the house colors. If you compare the two pictures, you will notice the middle looks very different. 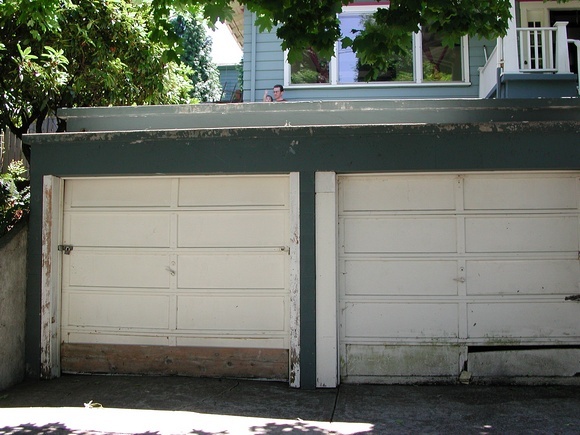 Previously, the two doors were centered in their respective openings, but the right garage is about 11″ wider than the left. This made for a funky imbalance in the trim. Stephanie had the great idea of shifting the right door over towards the right side, so that all trim could be the same size. 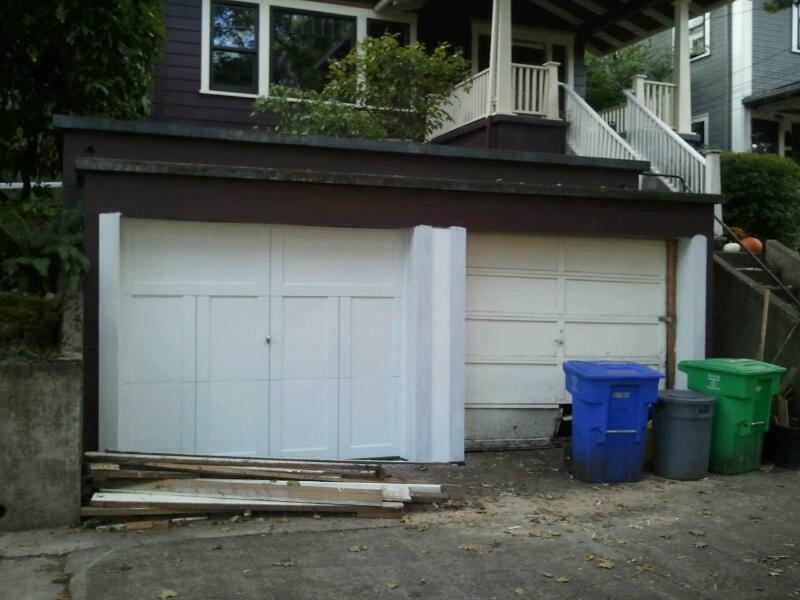 Fortunately, the CMU blocks in the middle section were recessed by almost 3/4″ relative to the concrete header, so it was a (relatively) simple matter of building this area up with plywood, which will get painted to match the garage/house color. The new symmetry gives the whole garage a much more polished look. The garage is going to look incredible!!! What color(s) are you going to paint it? Yea, $35 for a jackhammer is small potatoes compared to the time and body damage from hours of working with your other tool.